We see them all the time. The tiny bug with antenna busily working away making tunnels, gathering food, and just all around staying organized and on top of the situation. These tiny creatures are ants and can carry the title of “busy bees” easily. The opposite in size of the tiny ants are the super-sized carpenter ants. These large black ants are the largest in North America. These super ants can grown to nearly an inch long. They have a sweet tooth which is provided by aphids in your garden. The ants protect, tend, and feed the aphid colonies so they have an endless supply of the sweet juice produced by aphids. They’re also clean bugs removing unhealthy items from their colony. They also collect plant resins to use to clean the nests. Strength is a virtue and carpenter ants have extremely powerful jaws that allow them to lift items that are up to 7 times their weight. Carpenter ants use their powerful jaws to chew and the favorite item is wood. Decaying logs are a prime location for carpenter ants to retain their colonies. When decaying trees aren’t readily available, the wood foundation of your home is the next best place causing costly repairs. 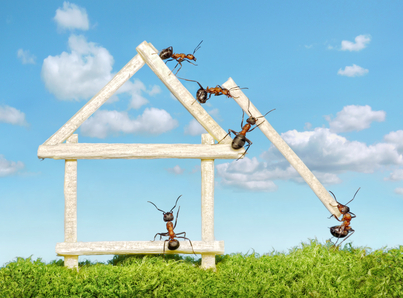 Contact our office and let our expert staff help you with your pest problems. Like we say on our website, give us a call and “Never worry about bugs again”. Previous PostThree Facts About Carpenter Ants You May Not KnowNext PostIs the Tick-borne Powassan Virus on the Rise in NJ?